Spinach Lasagna recipe by swtmanoo at PakiRecipes.com. Romano cheese (a hard, light-colored, sharp, Italian cheese, usually made of ewe's milk). Ewe: (a female sheep, esp. when fully mature). Add lasagna noodles and cook for 8 to 10 minutes and drain. In a skillet over medium-high heat, cook mushrooms, onions, and garlic in olive oil until onions are tender. Drain excess liquid and cool. Boil spinach for 5 minutes. Drain, and then squeeze out excess liquid. Combine ricotta cheese, Romano cheese, spinach , salt , oregano, basil , pepper, and egg in a bowl. Beat with an electric mixer on low speed for 1 minute. 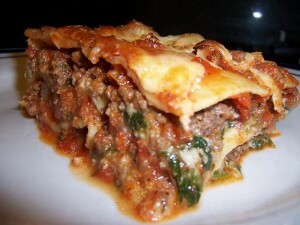 Lay few lasagna noodles in bottom of a 9x13 inch baking dish. Spread one third of the cheese/spinach mixture over noodles. Sprinkle 1 cup mozzarella cheese and 1/3 cup Parmesan cheese on top. Spread 1 cup spaghetti sauce over cheese. I love to blog and is currently writing on several matters specially on Seo like White Hat SEO, Black Hat SEO and so on a variety of Wordpress releated subject areas. Within my extra time I download Movies from Mediafire.